Hang Glider Cliff at Thacher State Park is a pretty amazing spot. 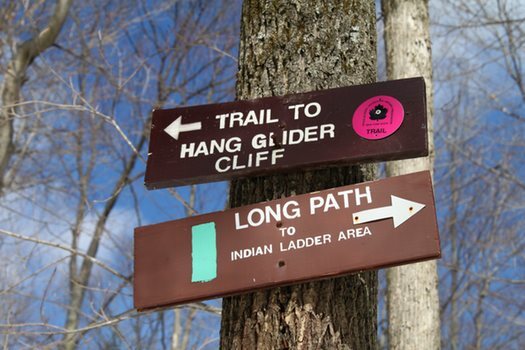 It's where many local hang gliders and paragliders take off from, and was once the starting point for a 71-mile flight all the way to Walton, New York (a record for the cliff). 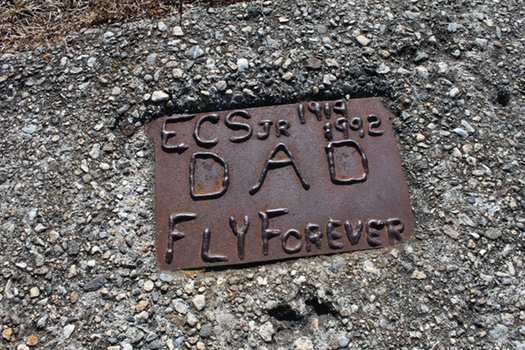 There's a bit of a mystery atop Hang Glider Cliff, a plaque that reads "Fly Forever Dad" with the initials "ECS Jr" and the dates 1919-1992. 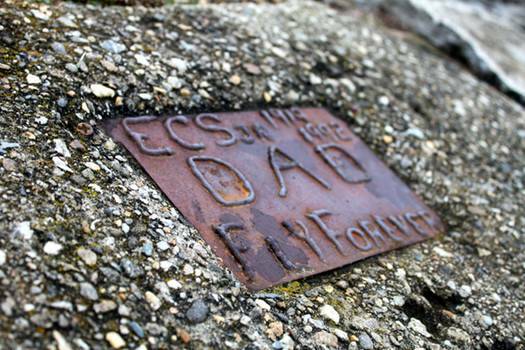 It's embedded in the cement of the small runway. So who is ECS, and who laid that plaque? Was it the site of a hang glider takeoff gone wrong? Is it a memorial for a man who loved flying, but died of other causes? Scroll to the top for a panorama photo. We found Hang Glider Cliff by accident while hiking along the Long Path and a few things immediately struck me as special about the site. The view is great: You can see the Albany skyline and miles and miles of farmland from the cliff. Not far from the drop there's a house with acres of land and a pond. There's a lot of wildlife: hawks, wild turkeys and turkey vultures. 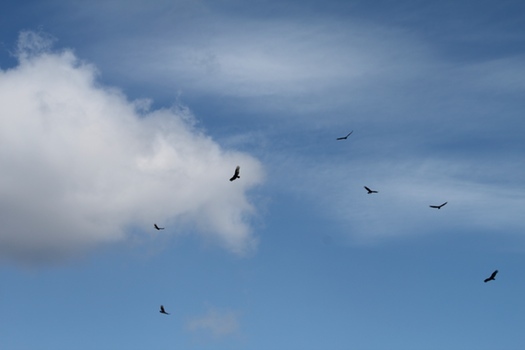 On our latest trip there the vultures were soaring above the cliff, catching rides in the rising thermals (much like the hang gliders and paragliders that take off from the site do). Hang Glider Cliff is secluded, but exposed -- and if you're leery of heights, just a little bit scary. The cliff itself has a rounded drop and is 1330 feet above sea level. There's an old tattered American flag that hangs with zip ties from a tree -- and that iron plaque. The plaque that's been in the back of my mind for months. 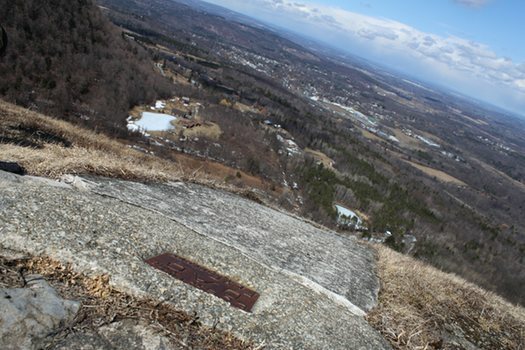 I contacted the Thacher Park manager, Chris Fallon, to see if he knew the story behind the plaque. He didn't, but gave me the name of the president and treasurer of the Hudson Valley Soarers, a local hang gliding and paragliding club that uses the site. The club's president, Bo Soiffer, told me about the site and about hang gliding and paragliding -- but Bo didn't know the story behind the plaque either, so he shared with me another name: John Sillero. John's the hang glider who holds the record for longest flight from Hang Glider Cliff -- that record 71 mile trip (that's him in the photo). 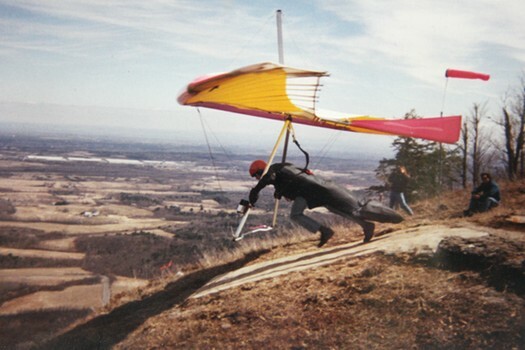 He's been gliding since the mid-70s, and at Hang Glider Cliff specifically since the fall of 1975. John knew about the plaque, but didn't know its history. Neither did any of the other gliders he asked. It was a mystery to them, too. A quick conversation with a former park manager and an unreturned phone call to an individual who owns land on the cliff left the plaque question unanswered. And it remains a mystery. But what is known is that the family, or the "Dad," who's memorialized there must have fallen in love with the place. And so have I. Getting there: You can access the cliff a few different ways. 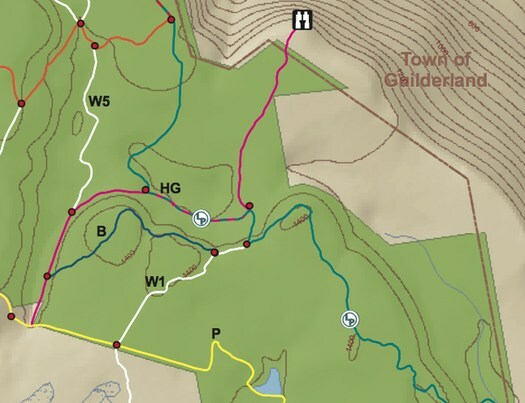 This park map shows you where the Hang Glider Road is (it's the magenta colored trail) and you can access that from the parking lot on Carrick Road. 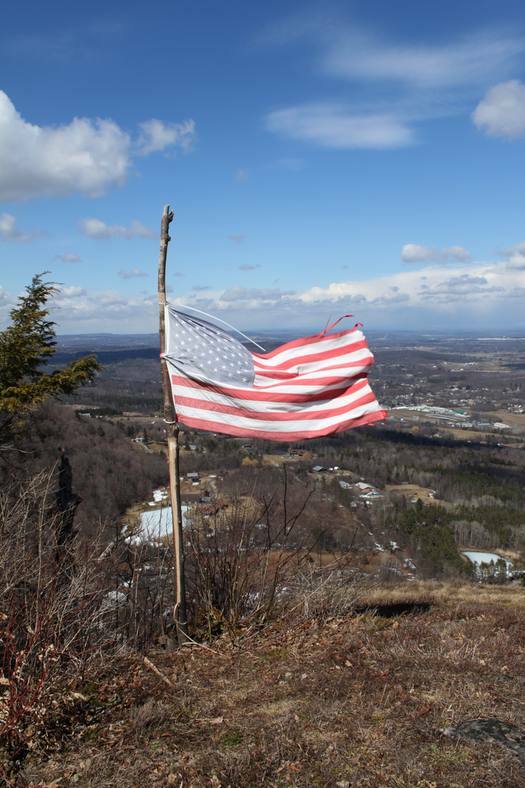 The cliff is the "scenic site" next to "Town of Guilderland." My usual way to get there is to follow the Long Path from its entrance near the park office in Thacher. If you go that way, you'll likely come across the sign to Hang Glider Cliff an hour and fifteen minutes or so into the hike (at a leisurely pace). I'd recommend bringing the map and looking out for signs on the way back. According to the SSDI, an Albany man by the name of Everett C Seymour lived from Aug 2, 1919 to Aug 1992. He may be your next lead. I suggest going to the state library and looking for his obituary in the old Times Unions for August of 1992. If he was an avid hang glider, it would probably talk about it there. CMON IT TOTALLY READS "dad fly forever"
Tim, thanks so much. We had a feeling that someone in the AOA crowd might have an idea on the next step. I'll look into that. There was an Everett Seymour of approximately the right dates who lived at 994 Delaware Ave. in Albany, and also one at 33 Pine Park Rd. in Berne. What a cool story... I can't wait to get up there and explore. Everett was likely born in Albany in the Clinton Avenue home of his grandfather. His father, Everett, was born in Maine and worked here as a house painter in 1920 and 1930. His mother Era (or possibly Eva) was born in Alabama. He had a brother Ernest, sisters Norma and another name that's hard to figure out. They lived on Dana Avenue in 1930. That was one of my favorite places to hang out when I was a teenager. That, and the place nearby we called High Point (perhaps that's where the Fred Schroeder Memorial is?). The State Library has the Index to the Albany Times Union on the 7th floor which covers 1982-2006, call number: R, 071.4743 qI38 84-56346. But, I tried an online subscription database that contains the TU back to 1986 and couldn't find the obit. for Everett C. Seymour. Also tried the Altamont Enterprise online archive, but didn't find it (1880s-2008 at http://historicnewspapers.guilpl.org/). Maybe my search skills are rusty. Love that cliff...was there on Sunday. The site was introduced to our club in 1978, the year after I joined, by a fellow named Bob Wallace who had been flying there sporadically for a few years. I remember the evening he guided a group of us thru the woods to that amazing launch. As I remember it, Bob would die tragically at his own hand not long after that. I believe I witnessed the first club member to fly there - Bill Orkis. I would have flown with him that evening had I not neglected to bring a part to my Kestrel. That plaque appeared mysteriously one day. Whoever placed it there knew to make it totally unobtrusive to our launch run. We later extended the concrete - you can see the seam in the photo. I know who is represented on the plaque and who put it there. The family that put the memorial there wishes to remain anonymous. Sometimes things just need to be left alone. It is Everett Seymour. His grandfather was a famous acrobat and vaudevillian, "O.G." in the early part of the 20th century. Leslye - putting dates and initials on something isn't the best procedure for remaining anonymous- it creates an automatic mystery. Eric - I am not sure why you are addressing "me" about the dates and initials, I didn't put them there. I was just pointing out that maybe the family doesn't want the mystery solved. I think its' wonderful and if someone solves it, then great. "Carl" who has blogged often is doing a lot of research and I find it admirable. I was there many many years back. If I am correct, isn't there a dirt road that has a stone quarry on the left and you can only drive so far down before you need a 4WD? Isn't there also a target shooting area there with tables? I'm trying to give directions to my daughter and I remember driving down a dirt road with a farm house right at the entrance to the road. I now live in Florida. I took some video up there of people hang gliding, on VHS tape, but not sure if I still have it or not.